Over the last few years I have been on my own pursuit of ‘realness’ and I have experienced both negative and positive responses to my constant drive to be utterly and completely myself, which has caused me to consider; how ‘real’ can we really be in a business scenario? First let us consider what is ‘real’. For me, it is not to be like a bull in a china shop with little care for the insult or damage you may cause. It is to be honest, open, be in the moment and respond creatively to those around you. To truly connect with the people you meet and learn more than their name, in fact I often forget their name because I am too busy getting to know the person! The world is swarming with people, so many that we will never ever meet them all and what a tragedy that actually could be (in most circumstances). Of course, this is also why the continued spread of blogs and the ability to share our thoughts across the world wide web is exciting. Maybe now we have the ability, more than ever, to connect with more people.We learn so much from those we connect with and no matter how small that influence may be, I am excited about the prospect of meeting more people and learning from them both in my life and in business. Sadly, I recently met with judgement and negative assumption. I am a very extrovert person, I will always see the best in a scenario, strive to entertain and lift the spirits of those around me. So when I recently had a dance and a little pose on a podium at a VIP party I was branded as ‘drunk’, ‘completely rat arsed’. I totally wasn’t. That is just me! So to those who assume the worst I say go ahead. I am just embracing life and I will always try to make the best out of a situation. If I am being misunderstood then at least I am being noticed! On the flip side by striving for ‘realness’ I have had some great connections with people I never would have met otherwise and it’s been genuinely enlightening. Cutting through the crap and really talking to someone rather than just politely shaking their hand is liberating. 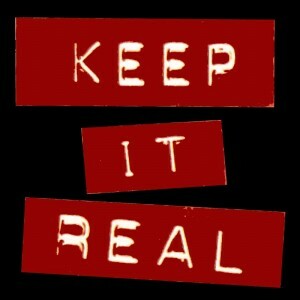 Thank you to those of you who have embraced the opportunity to keep it real in business. Next My Weight Loss Journey: And the First Stone is Off!